Transportation and mobility are critical drivers of innovation and economic growth in the 21st century. Rapidly evolving technologies and business models for delivering mobility services have dramatic potential to transform the global transportation sector in the times to come. Mobility that ranges from pedestrian, personal transport, to public transit and freight movement is extremely critical and impacts every aspect of life in urban as well as rural areas. So far public transport initiatives have mainly focused on urban areas neglecting the last mile connectivity thus resulting in individuals to resort to personalized modes of transport which has led to congestion and vehicular pollution. Of late, there has been a paradigm shift which has led to an integral approach that focuses on shared, connected and clean mobility solutions customized to local needs. In addition to this, the solutions to be developed should keep the aspects of affordability, accessibility and inclusiveness in mind. In the context of the same, MOVE Summit will held at Vigyan Bhawan on 7th and 8th September 2018 which will include a wide range of stakeholders to be engaged towards building a public interest framework for the global mobility agenda. The summit will include participation from international Industry leaders, Research Organizations, Academia, Government, Civil Society and Media. Last mile connectivity and the role of non-motorized transport, especially cycling will be critical in the deployment of integrated mobility solutions in future. Various business models are being experimented upon to promote cycling as not just a last mile connectivity solution but also as a healthy and cleaner alternative. 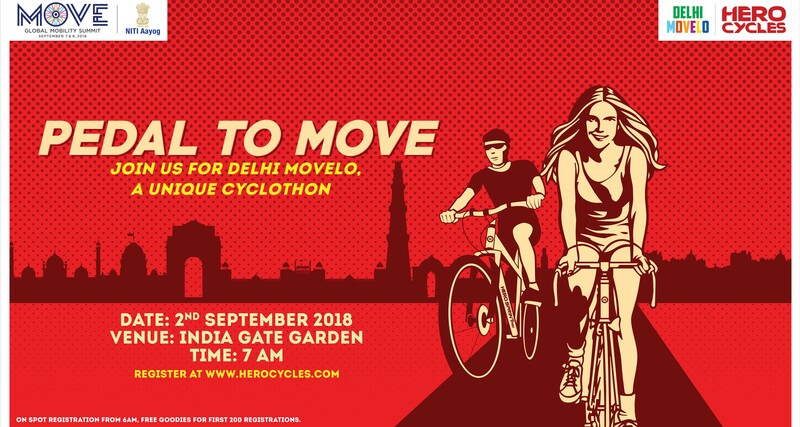 As a run-up to the summit, to promote awareness about cycling and its importance in mobility, NITI Aayog is organizing a cycle rally in association with Hero Cycles.